Bits & Bytes: Author of "The Backup Book" Dorian Cougias breaks down the benefits of serial ATA as the storage industry transitions off of parallel ATA. Beginning this year, the storage industry is transitioning from the legacy parallel ATA interface to serial ATA. The serial ATA (SATA) final 1.0a specification was released February of this year. Serial ATA specifies a thin, point-to-point connection that allows for easy cable routing within a system and increased cable length from 18 inches for the current 40-pin flat ribbon parallel cable to the 1-meter, very thin and flexible serial cable. This enhancement avoids master/slave, "daisy-chaining", and termination issues. 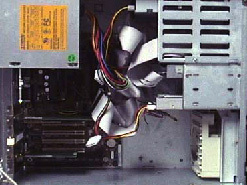 Also, better airflow can be realized compared to systems with wider ribbon cables. 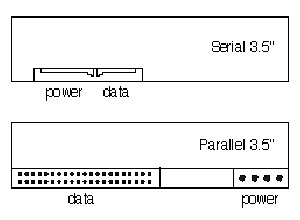 Below is a diagram showing the serial ATA connector next to the standard power connector for a drive. 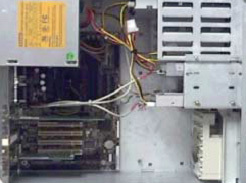 Below left is the inside of a PC with Parallel ATA cables, and on the right is the same computer with serial ATA cables. As far as performance goes, serial ATA technology will deliver 150 MB/sec of throughput to each drive within a disk drive array. It also supports all ATA and ATAPI devices, including CDs, DVDs, tapes devices, high capacity removable devices, zip drives, and CD/RWs. The key to serial ATA's higher performance (at least compared to parallel ATA) is its point-to-point topology. 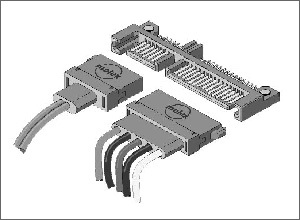 SATA does not have to share the ATA bus as in the traditional ATA master/slave topology. Add to that Serial ATA's dedicated 150 MB/sec maximum performance per device, and it can be seen that the bus already has room to spare when today's best-of-breed drives are hard pressed to deliver 100 MB/second. With today's parallel ATA implementation, pairs of devices share a common cable in a master-slave relationship. This interaction between devices results in the available bandwidth being shared between the devices. Additionally, since the devices on the cable interact, they must be jointly qualified, resulting in the substantial expansion of the system integrators' qualification matrix in order to comprehend all possible combinations of devices. By contrast, serial ATA is a point-to-point interface where each device is directly connected to the host via a dedicated link. Each device, therefore, has the entire interface bandwidth dedicated to it, and there is no interaction between devices. This means software can be streamlined, eliminating the overhead associated with coordinating accesses between the master and slave device sharing the same cable. Something else that parallel ATA doesn't offer is hot-plug connectivity. With serial ATA, devices can be hot-plugged (inserted directly into receptacles) while the system is powered on; ensuring device discovery and initialization are properly handled. Stay tuned for part two of this article, "Comparing SCSI and ATA drives"
Dorian Cougias is the founder and CEO of Network Frontiers, a company that focuses on disaster recovery, security, and IT infrastructure consulting, training, and books. Over the last twelve years, Dorian has overseen the launch, establishment, sale, and re-launch of Network Frontiers. While evangelizing The Backup Book: Disaster Recovery from Desktop to Data Center 3rd Ed., Dorian continues to consult to clients with significant data management requirements. He works extensively with application developers such as VERITAS, NetIQ, PowerQuest, and Symantec and with hardware vendors such as Dell, Quantum, and StorCase to insure that the IT community understands the benefit of their products and in turn that the vendors address the needs of the administrator.